Member of the European royalty adore a good hat. Whether it is bowed, plumed, bedazzled, or brightly colored, it appears that hats are the way to tell the world who you are, even when your ensemble is somewhat drab. However chic her style may be, Kate Middleton falls prey to the siren song of peculiar hats too, as she proved with her recent choice of accessories for Prince Philip's 93rd birthday festivities. The pancake-esque hat got me thinking: what other members of Europe's elite have worn hunger-inducing toppers? You'd be shocked at what constitutes a fashionable chapeau in aristocratic circles. Britain's royals appear to prefer saccharine-inspired caps, while Queen Maxima of the Netherlands and Quentin Bryce of Australia adore their breakfast foods in hat form. And a select few hat-wearers seem to have a secret candy-induced sweet tooth. But her Royal Highness Queen Elizabeth takes the metaphorical cake for her gateau-inspired confection, which looks likes a delicious, lopsided cake covered in a film of fondant. Grab a snack before you dive into this mélange of food-inspired hats, because whether or not their designers were inspired by food, the finished products appear to be the most divine works of molecular gastronomy. Of course we needed to start with Kate's most recent look. Mm, Kate's most recent look. This jaunty, chocolate cake-like hat isn’t Middleton’s fault; the Duchess was pregnant while wearing it, and I applaud her for even gracing the public with her presence, let alone attempting a fashion statement. 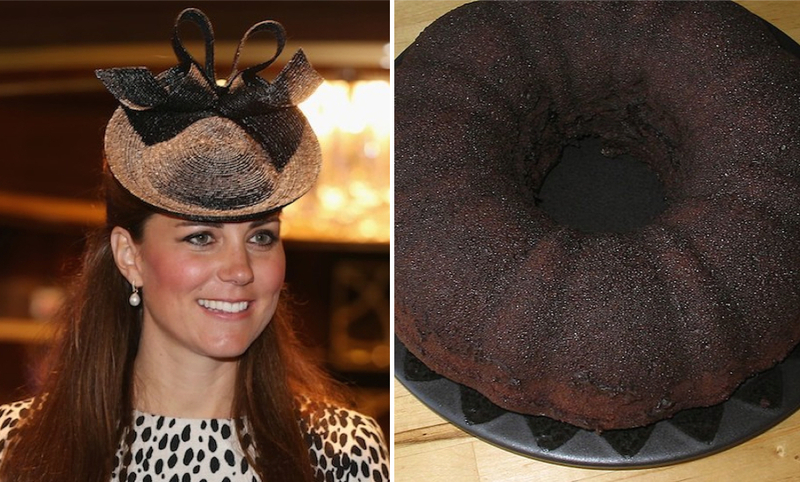 Perhaps Middleton was dreaming of a chocolate bundt cake like this one when she threw on her ensemble in the morning. This hat may be haute couture, but to me it simply looks like an H&H Bagel. Queen Maxima had the right idea; plain bagels are the best choice. If you often forget to indulge in your daily antioxidant intake, looking at this blueberry-esque hat serves as an excellent reminder. Now these blueberries look good enough to eat. Sure, this riding helmet is a clever way to keep horseback riding injuries at bay, but the design looks like a candied toadstool confection. Perhaps the hat doubles as a snack for post-equestrian fuel replenishment. Even looking at Katie Price’s hat recalls memories of childhood trips to the candy store. Lisa Scott Lee’s hat is an ethereal creation, but it bears a striking resemblance to cotton candy.Maybe Lee was inspired by a recent trip to the amusement park. Is it time for brunch? Because Quentin Bryce appears to think so. It seems entirely possible that Bryce and her egg-inspired hat were off to a lovely breakfast after her speech. Maxima Groningen’s hat is made up of tiny silver button snaps in reality, but from a distance, the chapeau looks like a gilded mushroom. The only quality separating Groningen’s hat from mushrooms found in the wild is its slight metallic sheen. One would think that as the ruler of Great Britain, Queen Elizabeth would be allowed to wear a hat that isn’t lopsided. But perhaps that’s simply an idealist notion of the monarchy. Even if this cake were lopsided, it would still look delicious.